Our first-ever Cocoa Crawl was a big hit! We will be back next year as part of Gresham’s Spirit of Christmas. Core Coffee – 600 NW Eastman Parkway. Enjoy scratch made hot cocoa and free pictures with Santa from 2 – 5 pm. Glass Butterfly – 29 W Powell. Serving hot spiced cider while you shop and take advantage of 50% off Black Friday Weekend Blowout selected items. All About Kids Resale – 121 N Main Ave. Warm up with hot cocoa and a sweet treat. Accent On Attitude – 20 NW 2nd Street. Cocoa Crawlers will enjoy hot spiced cider, cookies and 25% off all handbags. Off The Charts Games – 30 NW 2nd Street. Try some non-alcoholic Wassail and 20% off selected items during the Cocoa Crawl. Books Around the Corner – 40 NW 2nd Street. Take a peek inside this new business and nibble on Christmas cookies. Don’t miss the opportunity to enter the drawing for a copy of The Night Before Christmas. Maggie Mae’s Kids Bookshop – 43 NW 3rd Street. What is better than a warm mug of cocoa and a good book? Boccelli’s Ristorante – 246 N Main Ave. 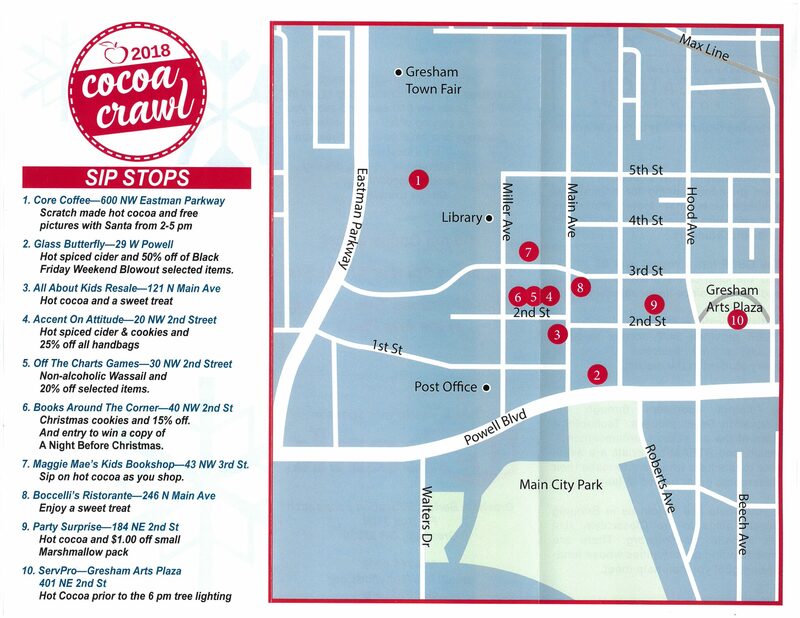 Enjoy a sweet treat during the Cocoa Crawl. Party Surprise – 184 NE 2nd Street. Peruse the amazing selection of party supplies while sipping on hot chocolate. Your Cocoa Crawl mug entitles you to a $1 off a small marshmallow pack. ServPro Gresham – As the evening draws to a close, head to the Arts Plaza and grab a final mug of cocoa from the ServPro tent as you join the countdown to the Christmas Tree Lighting at 6 pm. 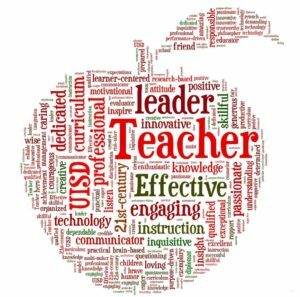 Tuesday, May 7th, 2019 is Teacher Appreciation Day! A national day to recognize the dedication, passion and influence teachers have in our community. You can join us in celebrating by sharing your gratitude for a teacher, staff member or administrator who has made a difference in your life, or the life of a loved one. Not only will your generous gift honor the teacher who has had an impact on you, it will also advance the mission of the Gresham-Barlow Education Foundation to “Bring Great Things to the Classroom”. We will send a personalized card to the teacher you select to let them know that you appreciate their contribution to your education. Include the honoree’s name in the “direct my donation to this program” area. Thank you to all of our business partners, you were great Sip Stops!